Caldecote is a village and civil parish in the North Hertfordshire district of Hertfordshire, England. 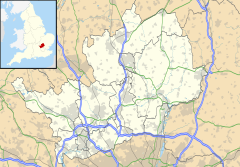 It is located around three miles north of Baldock and around a mile and a half east of Stotfold in the neighbouring county of Bedfordshire. The Great North Road passes just to the west of the village. Caldecot forms part of the Caldecote and Newnham grouped parish council, which covers an area of only 325 acres (1.32 km2). The village consists of a cluster of cottages around the redundant Church of St. Mary Magdalene, which dates from the 14th and 15th centuries and is in Perpendicular style. The church is currently in the care of the Friends of Friendless Churches charity. To the south of the church is a manor house dating from the 14th century. In the year 1724, several Roman urns, containing burnt bones and ashes, were discovered in this parish. During the 1970s archaeological excavations were carried out for a number of summers under the direction of Professor Guy Beresford. These revealed that during the 12th and 13th centuries there were approximately nine crofts lying to the north of the church and possibly three others close to the northwest boundary of the present manor garden. The population declined heavily during the mid-14th century, mainly due to the Black Death; no subsidy was paid in 1428 indicating that by then there were less than ten householders. The excavations demonstrated that after the manor was granted to the Priory the lands of the peasantry were gradually amalgamated. ^ "Caldecote St Mary Magdalene". Friends of Friendless Churches. Archived from the original on 2011-07-01. Retrieved 2012-01-05. Wikimedia Commons has media related to Caldecote.